Experience temples, trekking, yoga, and art in Kathmandu, Lumbini, Pokhara and the Annapurna circuit. 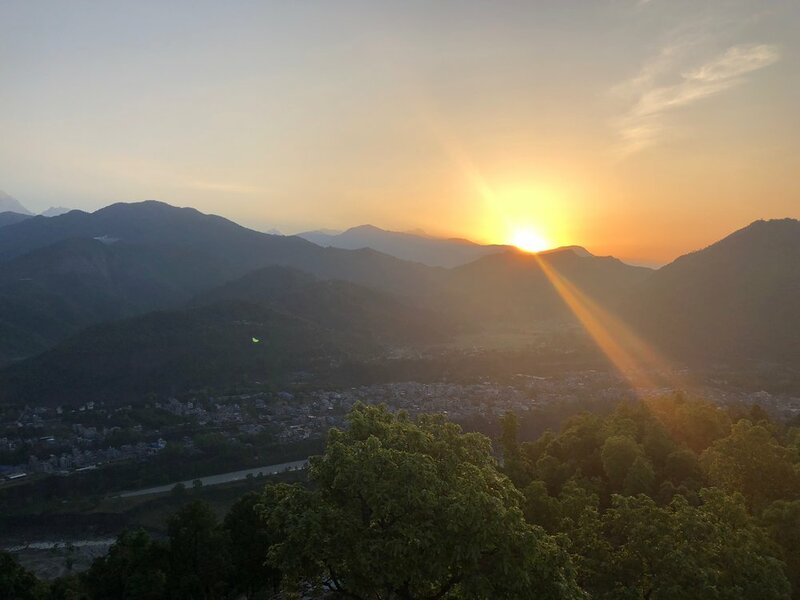 Enjoy fresh & healthy meals, guided explorations in Kathmandu & Pokhara, a 3-day trek, a 2-day yoga retreat, cultural education and much more with twice daily yoga with Gigi Mao. Guided tour options in Pokhara Valley to see Devi’s Falls, Fewa Lake, Gupteshore Cave, Bindabashini Temple & more. Welcome to the land of the Himalayas! Upon arrival at the Kathmandu airport, your driver will transfer you to your boutique hotel in the vibrant Thamel district. Settle in & rest up or explore this pedestrian-friendly area before our Nepalese Welcome Dinner of fantastic traditional cuisine and cultural education from our local guide, Kiran. After breakfast, we will explore the top cultural and historical sites in Kathmandu Valley. Our first stop will be the Swayambhunath Stupa - also known as the Monkey Temple - with 360 degrees of view of the Kathmandu Valley. The Swayambhunath complex consists of a stupa along with several shrines and temples, some dating back to the Licchavi period. Next, we’ll visit the Pashupatinath Hindu temple, one of the most important Shiva shrines and the most important Hindu pilgrimage temple in Kathmandu. We’ll also watch cremation ceremonies, an important tradition in Nepali culture, along the holy Bagmati River. After, we will visit Boudhanath, the biggest Buddhist stupa in Nepal situated in a colorful village replete with shops, huge prayer wheels and multitudes of chanting devotees. After lunch, we will visit Patan, the royal palace square that consists of 16th century pagodas and temples that are undergoing meticulous restoration after the devastating 2015 earthquake. The evening is yours to rest, explore and enjoy many cuisine options in Thamel, including Nepali, Indian, Thai and much more. After breakfast we’ll take a quick 45-min domestic flight followed by a short drive to Lumbini, the birthplace of Buddha. We’ll hop on bikes to visit the Maya Devi Temple, built in the 2nd century and dedicated to Buddha’s mother. We’ll also visit the Ashoka Pillar, built in 259 BC by King Ashok. When he constructed this pillar, the King exempted the villagers from paying tax and gave out 100 golden coins to the people. There are 10 different Buddhist stupas in this area, made by different countries with different monks. Each monastery has a unique architectural design and surrounding gardens. In the evening, we’ll enjoy tea time with local monks to learn more about Buddhism before a delicious meal on-site at our local hotel. After breakfast we’ll drive back to the airport and take a domestic flight to Pokhara, a vibrant, lakeside town at the base of the Annapurna mountain range. Take time to walk around and choose from many fantastic lunch options before our afternoon boatride on Fewa Lake to the Barahi Temple for sunset. For dinner, choose from the many different world cuisines in town and take a lakeside stroll where locals gather after work. Today is a free day to explore the many sites Pokhara has to offer. Check out the market, take a lakeside walk, or shop for fabrics, teas, or singing bowls. We’ll have optional guided tours to Devi’s Falls, the Gupteswor Gupha sacred cave, Bindabashini Temple dedicated to the Hindu goddess Durga, the Old Bazaar and the Mountain Museum, devoted to the mountains of Nepal and the mountaineers who climbed them. Inside you can see original gear from many of the first Himalayan ascents, as well as displays on the history, culture, geology and flora and fauna of the Himalayas. Tonight, get packed up for our 2-night trek. You’ll just bring the gear you need, and the rest you’ll be able to leave at your hotel in Pokhara. After an early breakfast we’ll transfer to Nayapul where our adventure in the Annapurna foothills starts! The first two hours of walking are along the riverside with villages and farming lands to Syauli Bazaar where the trail takes you uphill through the terrace, farming areas, local villages and natural surroundings. After a final uphill leg we’ll arrive at Ghandruk, one of the biggest local villages of this area with spectacular sunset views. Awake to impressive sunrise views of Annapurna South (23,661 feet), Hiunchuli (21,132 feet) & Fishtail (22,943 feet) and a delicious mountain breakfast. From Ghandruk, we'll trek straight down to Modi River valley, across the river then uphill through terraced land to Landruk, followed by easy walking through local villages, forested hills and Himalayan terraces to Tolkha for lunch. From here, the trail heads up to a forested hill, known as Deurali, before we reach Potana. After a tea break, we’ll have a last, short leg to our camp atop a hill with great views of Annapurna ranges as well as the Dhawalagiri Himalayan ranges on clear days. Enjoy dinner & Nepali tea under the stars before a good nights’ rest. Enjoy sunrise views of Dhaulagiri (26,794 feet), Annapurna I (26,542 feet), Annapurna South (23,661 feet), Hiunchuli (21,132 feet) & Fishtail (22,943 feet). From camp, we'll have a short hike down to Kande through forested hills before driving back to Pokhara. The afternoon is yours to rest & recuperate. Consider a massage at our boutique hotel spa, paddle board on the lake, or get some shopping in for Nepali mementos. After breakfast, we’ll take a short domestic flight back to Kathmandu, where we’ll head to Buddha to visit our community partner, a Thangka painting school. We’ll learn about this unique art style from a local master and its importance in Buddhism and Nepal. In the afternoon we’ll drive to Nagarkot for a post-trekking retreat in a gorgeous mountain setting overlooking the valley. We’ll have optional yoga in the evening with sunset views of Langang and the northeast Himalyan range. Today is retreat-style, with a full program of yoga, an Aryuvedic workshop to learn about traditional medicinal practices, an individual spa session, meditation and plenty of time to enjoy the beautiful gardens & grounds with optional hiking in the surrounding area. Meals served here are fresh & cleansing, with fantastic vegetarian cuisine and local teas. This morning we’ll take our time back in to Kathmandu with a stop in the cultural village of Bhaktapur. Take the afternoon for final shopping & explorations in Thamel or other parts of the city. We’ll reconvene in the evening for a special farewell dinner and closing to the trip. Depart any time today or add on a Mt. Everest Base Camp flight or trip to Tibet or Bhutan. Ashley Blakeis an avid traveler, cultural consultant and Traverse Journeys founder with a background in tourism, entrepreneurship and project management. She is a fluent Spanish speaker with conversational Portuguese skills and is just starting to study Arabic. Ashley has worked and traveled in 45 countries across Latin America, Asia, Europe, the Middle East and Africa including tours she has designed and led in Spain, Germany, Ecuador, Peru, Nicaragua, Morocco, Croatia and China. Ashley traveled Nepal with our guide Kiran in 2018 and immediately saw the beauty of the country's culture, history, and incredible natural surroundings. Kiran Bhatta is from Gorkha, Nepal, and shares his love of history, culture, geography and archeology with the hundreds of travelers that he guides through Nepal each year. Kiran received his Masters in English literature as well as training by the Academy of Tourism & Hotel Management and is also the president of Bhimarsha Youth Foundation Nepal. Meeting new people and interacting with them is one of Kiran’s favorite things, and he believes that if travelers can enjoy the authenticity of the places they travel, then their travels are a success. Gigi Mao has been a devoted practitioner of yoga for more than a decade and teaches alignment-based flow. Her classes are strong and focused while supportive and introspective. Gigi has led yoga retreats in Mexico, Costa Rica and Nicaragua and has traveled extensively in Asia, Europe and Africa. Gigi believes that both yoga and travel are a means of connection and is passionate about creating spaces for adventure and growth. Gigi was our instructor for the November 2017 Nicaragua Yoga + Surf, October 2018 Morocco retreat and teaches weekly public classes at Practice Yoga Austin.